Okay, so this post is a bit of a departure from the norm, but I’ve been thinking about writing something like this for some time while I’ve been doing very little baking to blog about. Truth be told, I don’t lead a particularly exciting life away from my oven, but I’ve been enjoying a few things recently to make up for my baking slump. I’ve been trying quite a few new recipes recently to make up for the lack of cake in the house. 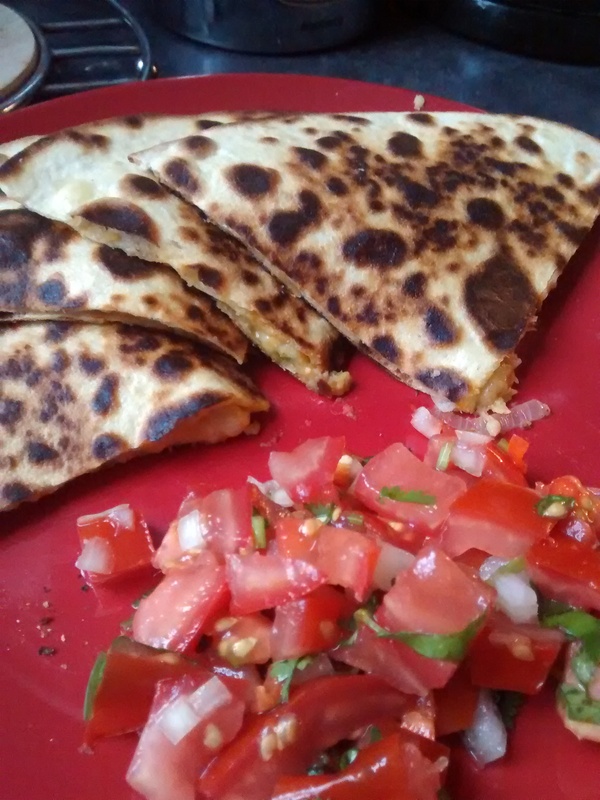 These Spanish quesadillas with chickpeas and manchego were brilliant – so easy and tasty, and even better with a spicy chunky salsa. The recipe is on Foodandwine.com here. I love dips of all kinds, but I’d never tried cannellini bean dip before making this recipe. 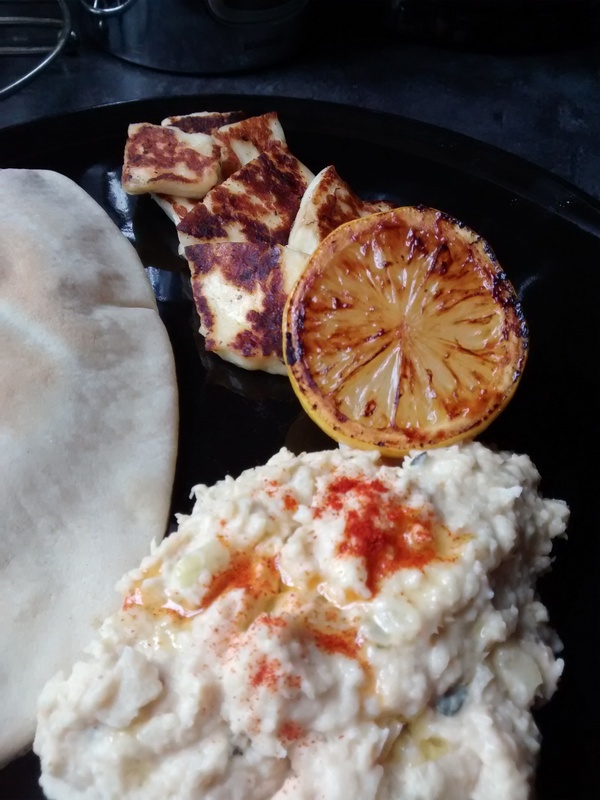 It’s really nice, especially with halloumi and pittas. I found the recipe on Diversivore here. 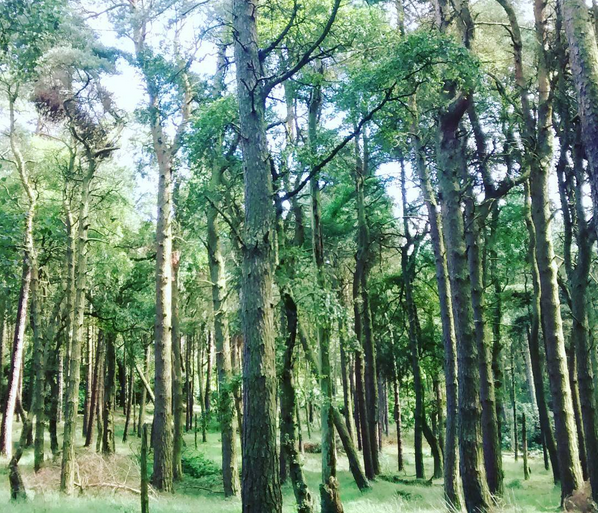 My husband only has Mondays off work at the moment, so I booked a day off work a few weeks ago and we went to Lyme Park, which isn’t very far from us. 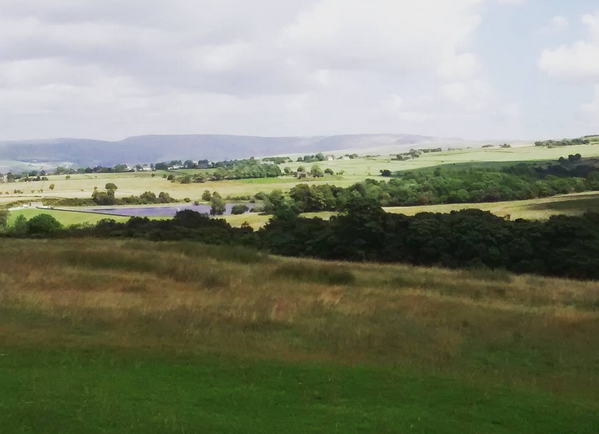 We only walked around the grounds and didn’t get to look inside the house, but it was a lovely day and there were lots of gorgeous views to be had. We stopped off at The Hope Inn for some very good ales on the way home, which is always a great way to end an outing! I’m a huge bookworm and always have a book on the go. I have quite an eclectic taste in books – I love Victorian novels, fantasy, science fiction, literary fiction, historical fiction, children’s books… as long as it’s well written and has great plot and characters, I’m not picky! I finished Hester by Margaret Oliphant the other week. Oliphant is a relatively unknown novelist from the Victorian era who wrote an astonishing number of books, and was notable for being the sole breadwinner for her family and an array of relatives – not really the norm for women in the 19th century! Hester focuses on two similarly strong female characters and is particularly interesting for being more focused on character development and the inner thoughts of the main characters than on plot (although there is a plot – it just moves a little slowly!). I really enjoyed this, although it felt like it took me quite a while to get through. I bought The Diet Myth a while ago when I was thoroughly bewildered and depressed by my body’s inability to shed some ruddy pounds despite doing ALL the running. 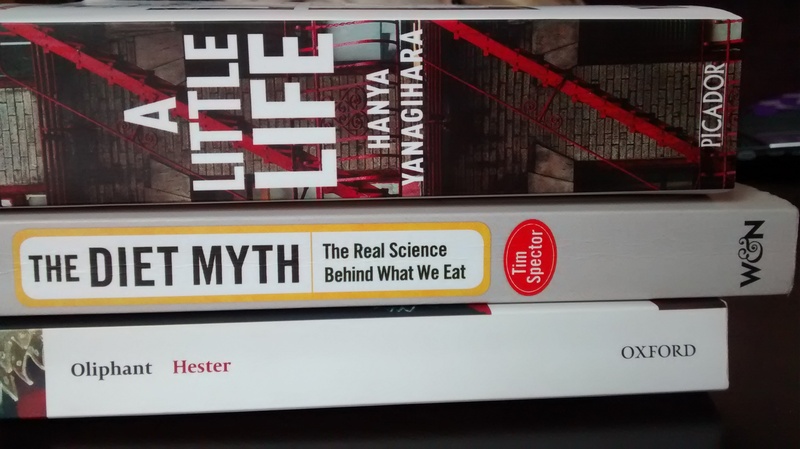 I started reading it last week, and it puts forward a really interesting argument for eating based on what your good gut microbes want, rather than following a fad diet (don’t get me started on bloody gluten-free, fun-free clean eating) or starving and exercising yourself close to death. The best thing is that the author basically orders you to drink red wine and coffee and eat cheese, dark chocolate and full-fat yogurt! I wrote a review on LibraryThing, which you can find here if you’re interested. I started reading A Little Life yesterday and I love it so far. I hear it gets quite distressing further into the book, but I haven’t got that far yet! At the moment, I’m just enjoying the writing style and being transported into the main characters’ thoughts and lives in New York. You can peruse my book collection and make friends with me if you like on LibraryThing. I read 50 books last year and I’m aiming to beat that this year, but we’ll see how long it takes me to get through A Little Life…! 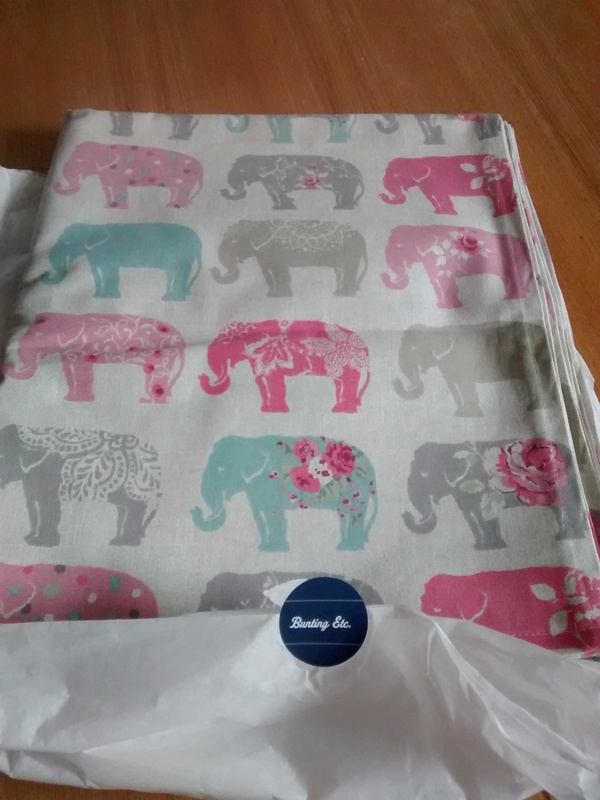 I do love to shop, especially when it comes to elephant-related items. This gorgeous tablecloth was made by one of my very talented in-laws (it’s still weird that I have in-laws), Amanda, who runs an Etsy shop called Bunting Etc. I’d really recommend checking out her shop if you like quirky home accessories (you can put in requests for specific prints/items too). I cannot WAIT to use our new tablecloth when we next have a dinner party! I had a real chocolate craving on Friday. 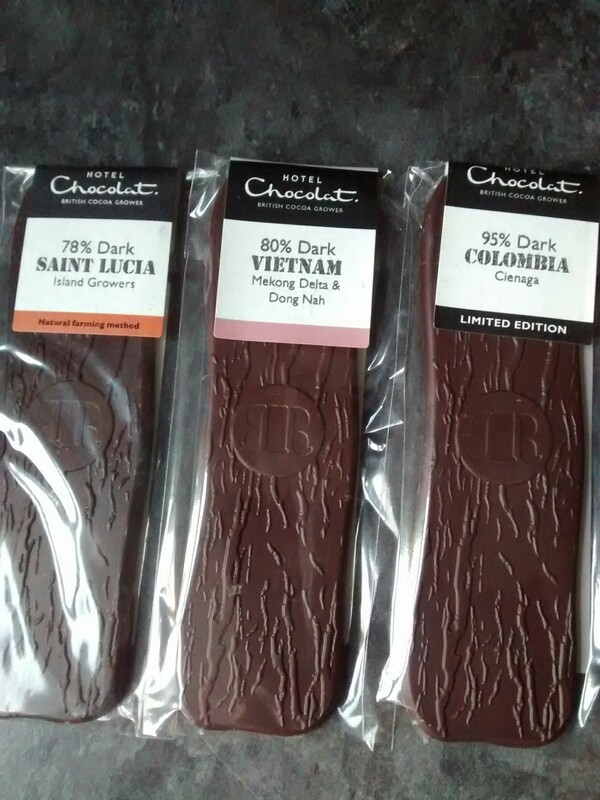 I’m trying to cut down my sugar intake at the moment, so I took myself off to Hotel Chocolat and treated myself to some bars of posh dark chocolate to see if this could calm my brain down without the fat and high sugar of milk chocolate. And it did! I’ve had most of the Vietnam bar so far and it’s lovely. Can’t wait to try the others! You can find this range online here. I’m a proper make-up junkie – I wear it most days and love investigating new colours. 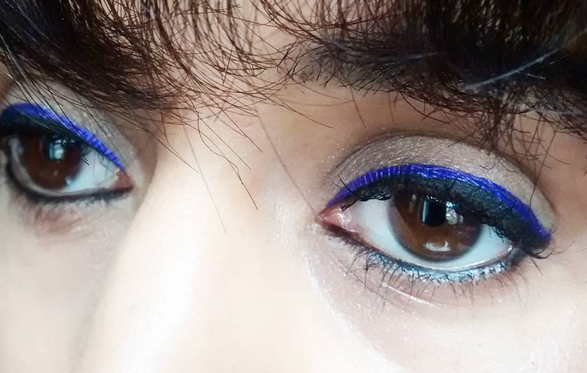 I have a ridiculous number of eyeliners, but couldn’t resist this bright purple number from NYX (Studio Liquid Liner) a couple of weeks ago. I’ve also recently bought a couple of NYX lipsticks (their Soft Matte Lip Creams are BRILLIANT) and a startling blue eyeliner from Laura Mercier. Understated, neutral make-up isn’t really my thing! 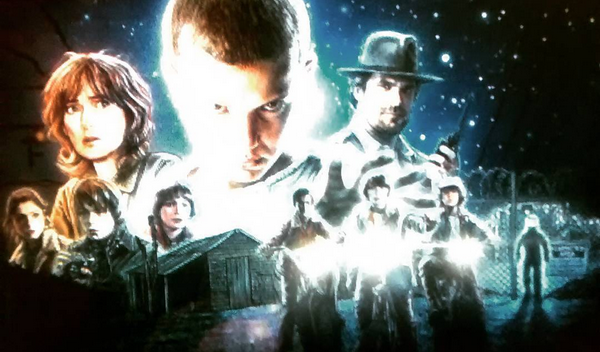 If you have Netflix but you haven’t watched Stranger Things yet, what are you waiting for?! This show has had a lot of hype recently, but I’m happy to report that it’s all very much justified (unlike the hype for Breaking Bad, which bored me to tears 3 episodes in, and Jessica Jones, which I abandoned 4 episodes in). It reminds me a lot of Stephen King’s supernatural stories, which is no bad thing. The soundtrack is awesome, too. Probably the main thing I’ve watched recently has been the Olympics. I’ve so enjoyed seeing Team GB grab a huge haul of medals, and I’m counting down the days until the Paralympics! I’ve also recently started watching The Gilmore Girls on Netflix, which I never saw the first time round. It’s very funny and a pleasure to watch – definitely one for women who are sick of romcoms and like their comedy a bit smarter. I did of course, see the first episode of Great British Bake Off, which I enjoyed despite the tears and what seemed like very harsh judging for the first round. I think I enjoyed The Chronicles of Nadiya more, though – Nadiya is such a star on screen, and her experience of growing up in Britain but having another ‘home’ country to visit really resonates with me. Me and my husband have been going to the Liverpool International Festival of Psychedelia for a few years now. It’s brilliant if your music tastes lean that way, and also if you hate camping! The festival’s organisers create a Spotify playlist each year to introduce you to some of the bands that will be playing that year, and I’ve enjoyed quite a few songs on this year’s playlist. The festival has been getting more and more popular every year, to the point where this year’s headliners are Super Furry Animals, which is very exciting! I think they were the first headline act I ever saw at a festival way back when I used to go to V, so it’ll be particularly nice to see them in Liverpool next month. 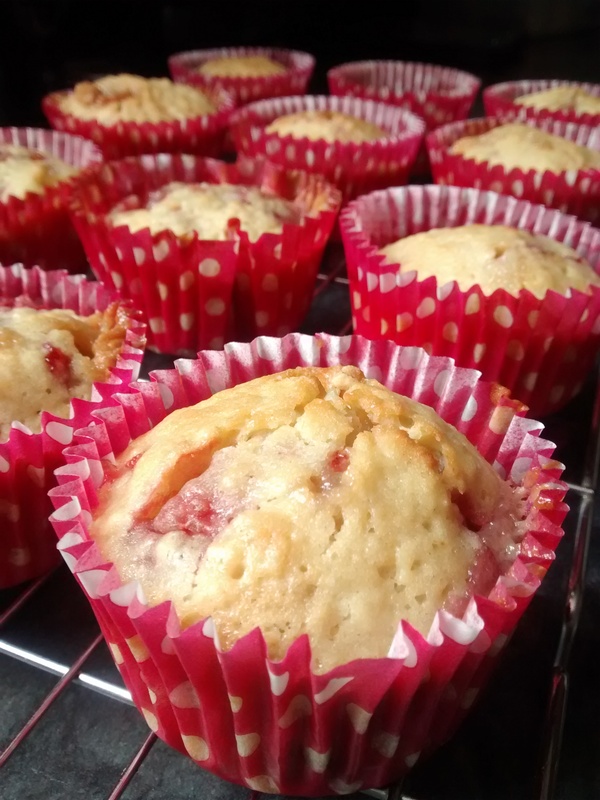 My love affair with strawberries is still very much in swing, as evidenced by these strawberry and white chocolate muffins that I made a few weeks ago. I reckon I’ve probably eaten about 2kg of lovely British strawberries so far this summer… it’s a good job they’re healthy, isn’t it?! I was lazy and found a recipe online to use, rather than adapting one of my existing ones. I used vanilla extract rather than a vanilla pod and chopped up a white chocolate bar instead of using buttons (I actually think the recipe can stand a bit more chocolate, to be honest). 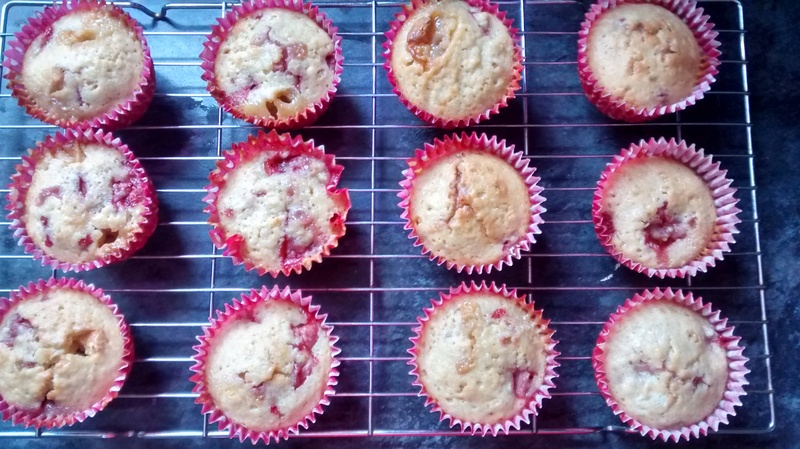 I don’t think these are quite as rich as they could be (I found the mix to be fairly runny rather than nice and thick), but they’re still delicious thanks to the use of fresh, in-season strawberries. 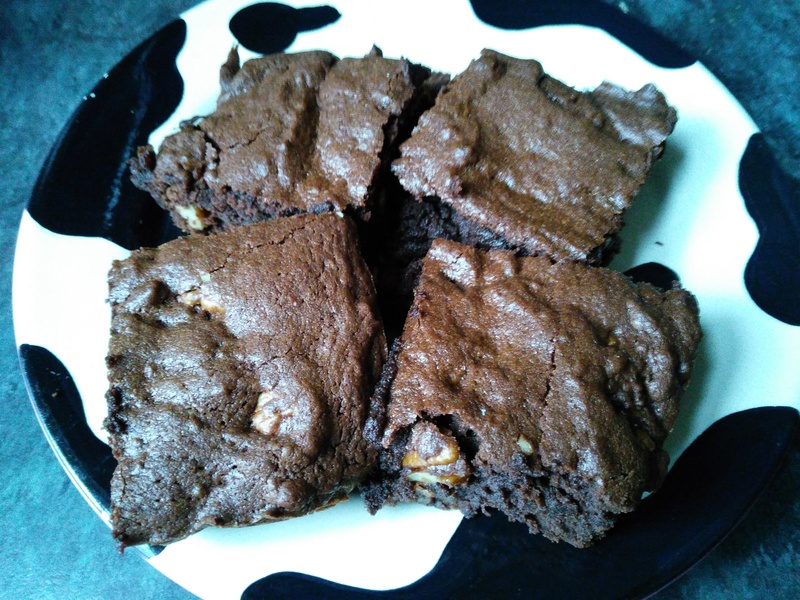 I did find that I had to bake these for a lot longer than the recipe said, which made me worry that they would turn out all tough and horrible, but I kept a beady eye on them and took them out of the oven as soon as they looked lightly browned on top. 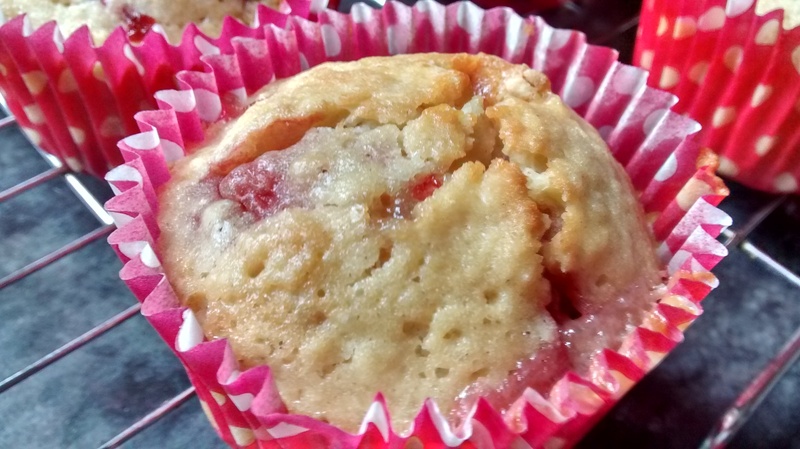 The muffins were wonderfully soft and fruity, and went down a treat in my perpetually sugar-starved office, which is always nice! 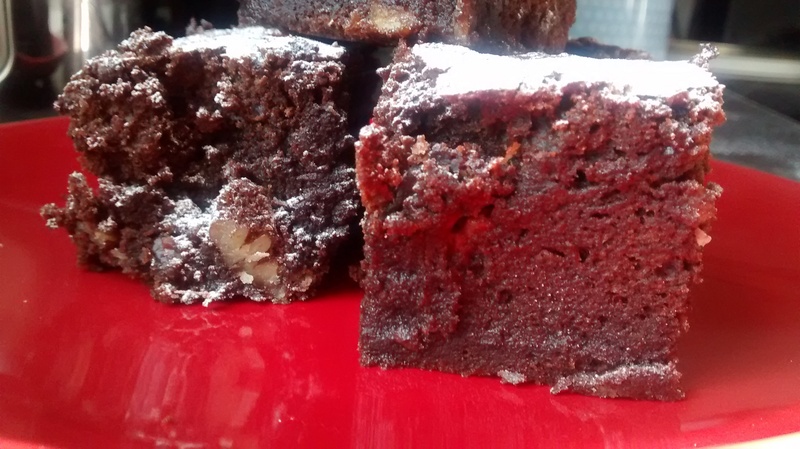 Now, confession time: I’ve been in a bit of baking slump recently. I think I overstretched myself a while back when I did three lots of baking in a week… oops. I’m also trying to get a handle on my eating habits while I recover from a hip/lower back injury I sustained in the Manchester 10k back in May. I haven’t been for a run since June and my waistline definitely knows it. I’m going through physio at the moment, which seems to be going well, so hopefully I’ll be back on the baking wagon before long. No doubt the Cake Olympics (AKA Great British Bake Off) will whet my appetite for cakes again and I’ll be desperate to get the oven on come the 24th! So if it’s a bit quiet around here, you’ll know why, but I might pop up with a curry recipe or something at some point! No, I didn’t go on the baking bender to end all benders in one night. 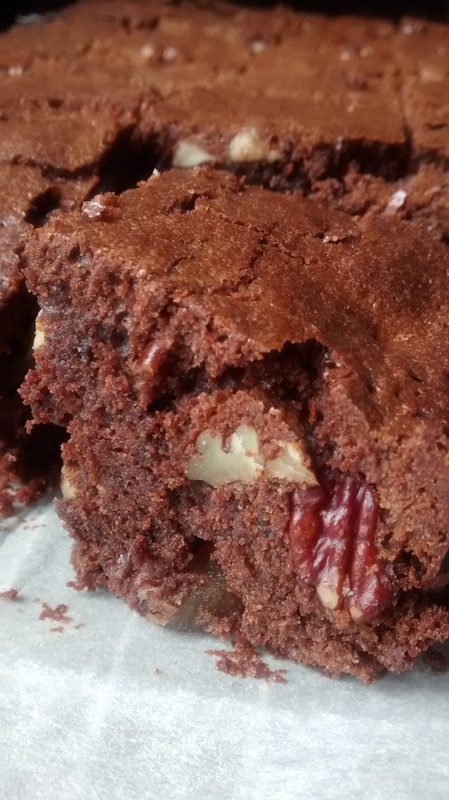 I made these three recipes – frosted walnut layer cake, peanut butter cookies and Oreo brownies – over the course of the last few weeks, but haven’t had a lot of time to blog about them what with planning a wedding, organising my hen do, training for a 10K and, of course, just normal everyday life! 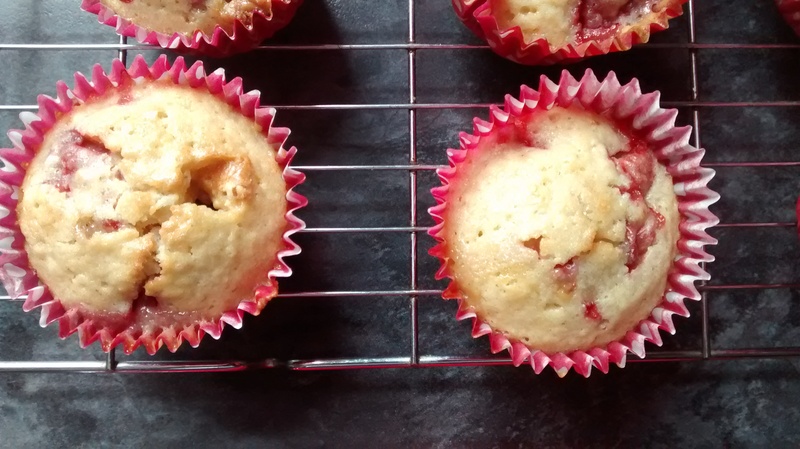 I thought it would help to blog about all three recipes at the same time, rather than labouring over three separate posts. And, hey, you get to drool over even more baked goods than usual! I made this cake (pictured above) for my fiancé, who has been begging me to bake it ever since it turned up in a technical challenge on last year’s Great British Bake Off. It was fairly challenging, so I can only imagine how difficult it is without a full recipe to follow! This is basically three layers of walnut sponge sandwiched with a big pile of buttercream and smothered with an even bigger pile of icing. 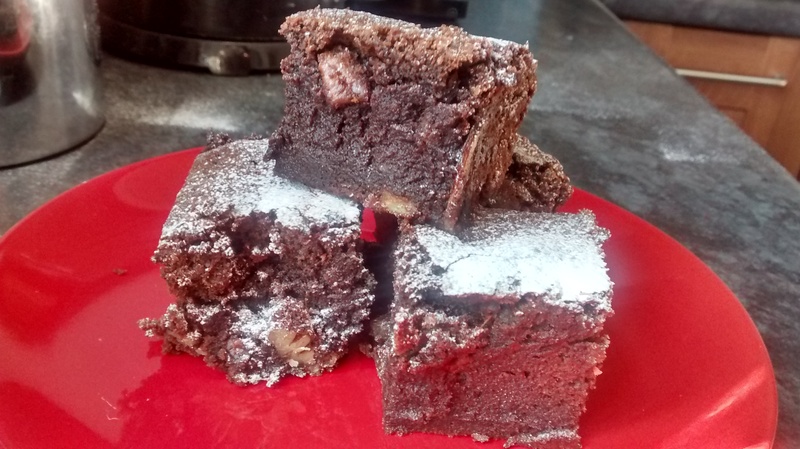 There’s so much sugar in this recipe – be warned if your teeth tingle at the merest hint of sweetness! 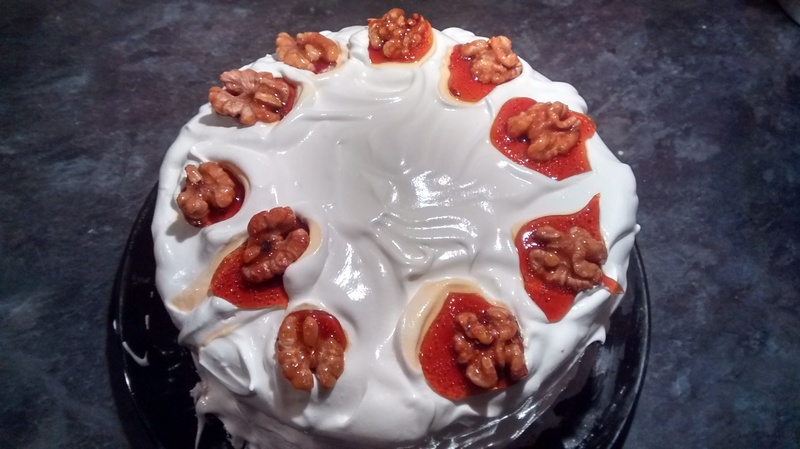 The icing was quite tricky, and didn’t seem to completely set (I can’t remember from the show whether it’s supposed to, though), but I was pleased with my caramelised walnuts. 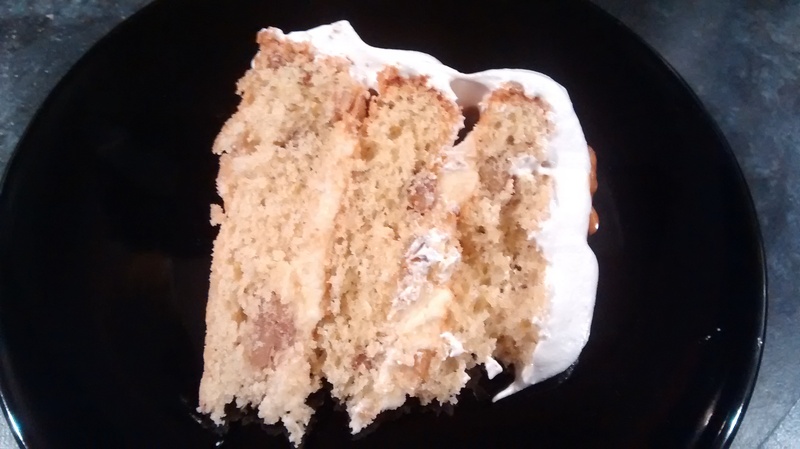 I think my favourite bit of the cake was the buttercream, to be honest! You can find the recipe on BBC Food here. 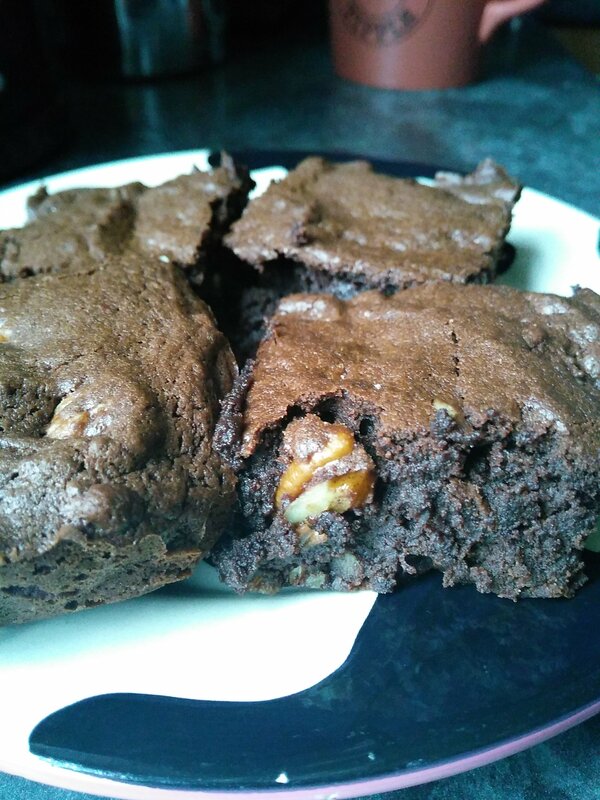 I made these when I found myself without any baked goods in the house, which really isn’t a great situation to be in. The recipe is from Dan Lepard’s Short and Sweet. 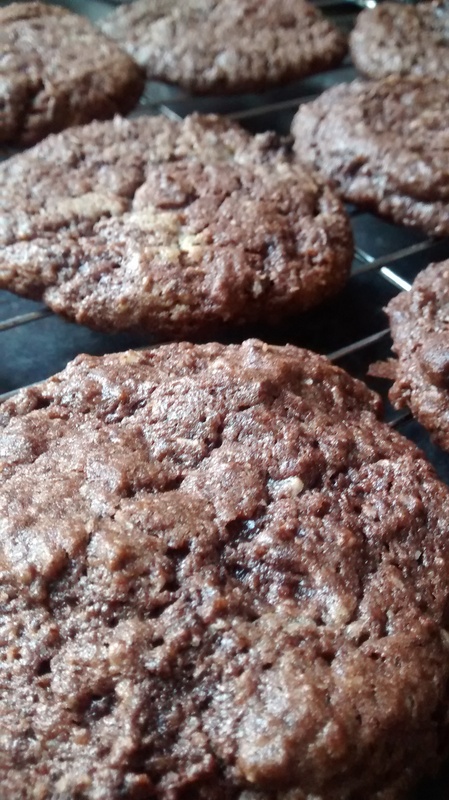 I followed it to the letter, using spelt flour rather than the other option of wholemeal, but added a chopped up Twirl (milk chocolate fingers for the international readers out there!) at the last minute, just for the hell of it. 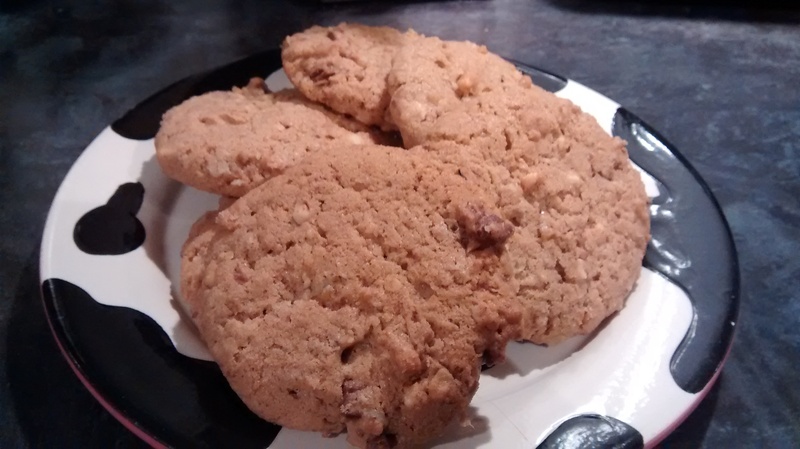 The cookies were gorgeously peanutty, but also ridiculously sweet! I don’t know if that’s down to the brand of peanut butter I used (think it was the ultra cheap stuff from Asda), the addition of the chocolate, or because Dan really does call for too much sugar, but just be warned! I’d tone it down next time by reducing the overall amount of sugar from 325g to about 200g. 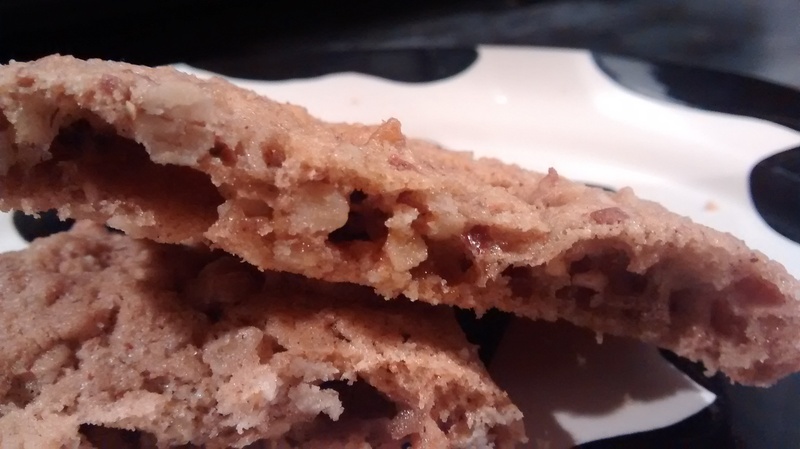 The texture was rather interesting – they weren’t soft like a traditional cookie, but had more of a biscuit-like crunch, and also had distinct layers, which I assume is down to the bicarb. You can find the recipe on the Guardian website here. 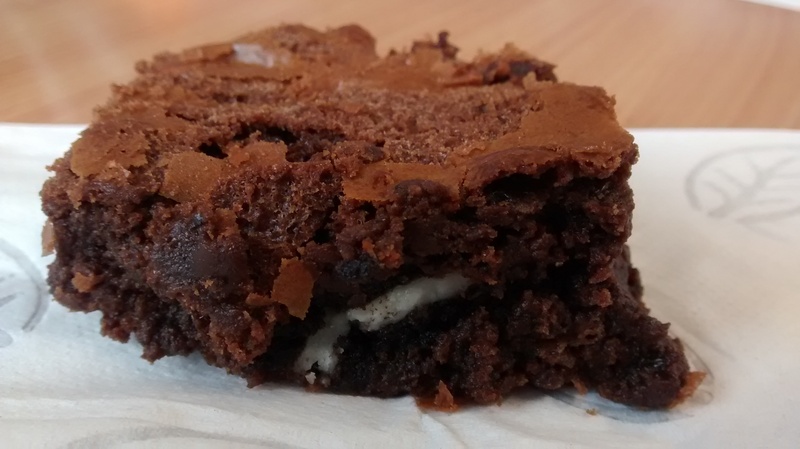 Finally, I made these Oreo brownies after almost a year of a colleague asking (begging!) me to make them. I made them a few days ago for his birthday, and I think I met expectations! Preheat the oven to gas mark 3/160C/140C fan. Grease and line a 20cm square tin. Melt the chocolate and butter together in a pan or in a bowl set above a pan of simmering water. Set aside and leave to cool slightly. Whisk the eggs until pale then add the sugars and whisk again thoroughly. Sift the flour and baking powder into a bowl and stir the Oreos in to coat. Add the flour and Oreo mixture to the wet ingredients and stir until just combined. Pour the mix into the tin and bake for about 1 hour, checking the brownies after 40 mins in case your oven is better than mine! 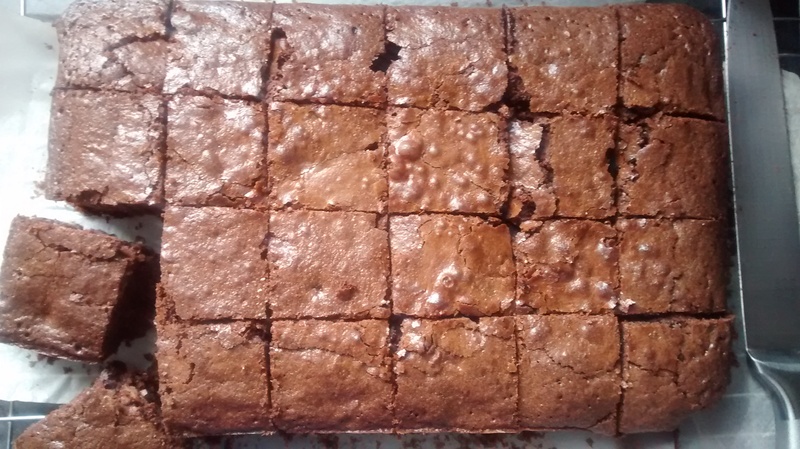 Once the brownies look set on top, remove them from the oven and leave them in the tin to cool for at least 1 hour before slicing them up. 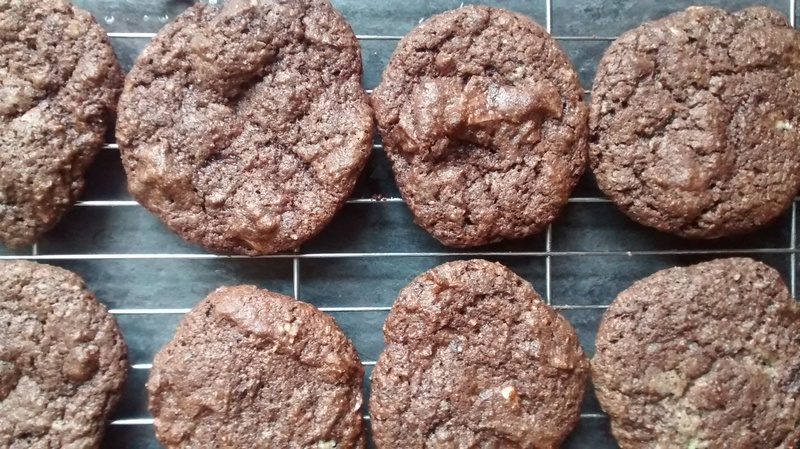 I had a real craving for chocolate last weekend, but I didn’t want to expend too much effort on baking something wonderful, so I trawled through my saved recipes on Pinterest before I found a simple-looking recipe for double chocolate and coconut cookies that I immediately revised so they would become triple chocolate and coconut cookies (and why not?!). This is a great little recipe if, like me, you’re one of the few people you know who would *never* leave the Bounty chocolates in a box of Celebrations to the end (I tend to save that fate for the Milky Ways). I guess these are technically quadruple chocolate cookies, because there’s milk, white and dark chocolate AND cocoa, but ‘triple’ rolls off the tongue a bit more easily. I followed the original recipe fairly closely, but have listed my own take below if you want to go as chocolaty as possible. 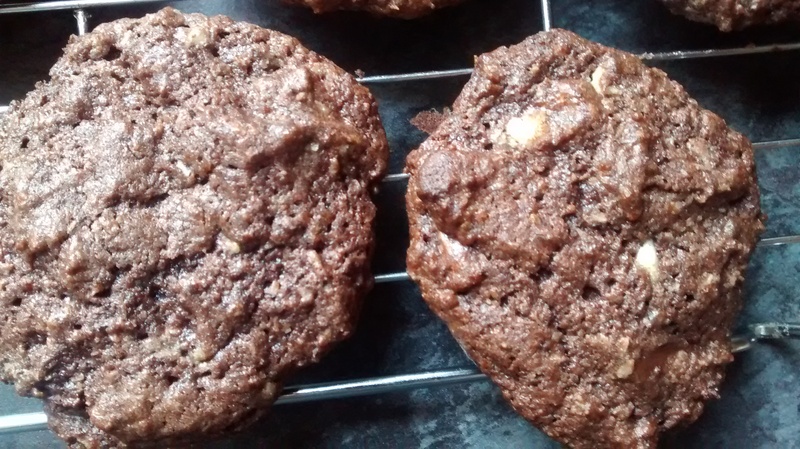 You could always focus on one of the types of chocolate if you like, but having all three in there does make the cookies a bit more decadent! Pre-heat the oven to gas 4/180C. Line 1 or 2 baking trays with baking parchment. Beat together the butter and sugar until well combined. Sift in the flour, baking powder and cocoa powder, then fold through gently until combined. Stir in the milk, followed by the chocolate and coconut. Mix thoroughly. Transfer spoonfuls of the mixture to the baking tray(s), spacing them well apart as they’ll spread in the oven. Bake for 12-15 minutes, depending on the size of your spoonfuls (mine were somewhere between teaspoon and tablespoon size, and were baked in 15 minutes). Cool on the tray for a few minutes before carefully transferring the cookies to a cooling rack (they’ll still be soft, but will harden as they become completely cool).